The aim of the site is to provide an alternative to conventional journey planners, by enabling intending passengers to make their own judgement on appropriate and achievable itineraries and connections. Information is updated nightly from data feeds provided by Network Rail, except for details of station connection times, train schedules for Ireland (North & South) and some bus and ferry schedules, which are updated weekly from data feeds provided by ATOC. Future plans include the addition of real-time updates and historical information on actual train arrival and departure times. Comments and queries are welcome: info@brtimes.com. The core functionality of the website is the departures board for each station. This shows all services departing that station on a given day. Departure board entries are shown with a pale yellow background and as well as the "basic" information, i.e. public departure time and train destination, various other pieces of information from the schedule are included to help you make an informed choice about which train to catch—these are illustrated in the example below. Note that the actual platform used might be different from the scheduled platform, and might vary from day to day. For smaller stations, where it is usually obvious from the train's origin and destination which platform it will be using, platform detail is not normally included in schedules. In this case, if the line the train will use on departure from the station is known then this is shown instead, since it is sometimes useful for guessing which platform a train will use. If the train visits any station more than once during its journey, one or more via points are additionally shown beneath the destination, in an attempt indicate the route taken. Although the British rail network operates as an integrated whole, the day-to-day operation of train services is the responsibility of various private companies, known as TOCs. The RSID is a 6-character code, assigned to each publicly-advertised passenger train, that uniquely identifies the train (throughout the entire rail network) on a given day. Clicking on the TOC name / RSID will bring up the schedule for the train. Facilities are available as shown for the next segment of the journey, immediately after departing this station (note that the facilities available may occasionally change later en-route). The working timetable used by railway staff operates at a resolution of half a minute, and often contains some slight variations in arrival and departure times when compared to the publicly advertised timetable; this is known as an advertised differential. For example, for the sake of simplicity a train may be shown as arriving and departing a station at the same time—however even at the smallest stations, half a minute is always allowed for station duties, e.g. operation of the doors and boarding / alighting of passengers. It should be noted that when the working time for a departure is later than the public time, railway staff are normally instructed that the train should still leave at the publicly advertised time whenever practicable. In practice however, there are many reasons why the working time may need to be kept to, and when trying to make a tight connection it can be very useful to have knowledge of the advertised differential. Usually known as the Train Reporting Number, or Headcode, this 4-character alphanumeric code identifies the train for signalling purposes. It is not unique and may be used for multiple trains in a given day, or simultaneously in different parts of the country. Schedule data is derived from train planning systems, which use a mathematical model of a train's acceleration characteristics and load (i.e. the weight of the train) together with its maximum speed to calculate a set of timings, which comprise the schedule. The model used in planning each schedule is known as the timing load for that schedule. The timing load and maximum speed are shown here because they can often be used, with some care and judgement, to get a good idea of the type of train that has been planned to work a given schedule. This can be important information when deciding on a preferred train to catch. When using the timing load to judge the type of train likely to be working a given schedule, the most important thing to bear in mind is that a train with faster acceleration and/or a lighter load can keep to a schedule designed for a train with slower acceleration and/or a heavier load. In other words, if a TOC wishes to subsitute a slow train with a faster one, there is no need to modify the schedule, since the faster train will be able to keep to the timings of the slower one. This is the most common reason for a discrepancy between the train operating a schedule and the timing load for that schedule, although there are other reasons too. Shown below is an example of an entry in an arrivals board. These are shown with a light grey background to distinguish them from departure entries, but apart from that they are very similar. This example illustrates some additional features of the Departure and Arrival Boards, which are described below. This train has two portions. For this section of the journey they are attached together, but they have originated at two separate locations. A filter station has been specified, meaning that only trains that have called at the filter station are displayed, and that the public departure times (of both portions of the train) from the filter station are shown. Clicking on the departure time for the filter station will bring up another arrivals board, with other trains highlighted according to the minimum connection time for that station, to show whether they are valid connections or not. This is in fact an unusual case, where both portions of the train have called at the filter station at different times, prior to being joined to each other. As both portions arrive at their destination at the same time, there is no time to be saved by boarding the portion that departs first, so its departure time is shown "greyed out". More generally, a "greyed out" arrival or departure time for a filter station indicates that the train (or portion of a train) has been caught up or overtaken en-route by a faster train. A train's journey is displayed as a sequence of station-to-station links, including departure (light yellow background) and arrival (light grey background) times and scheduled platforms (where this information is available). Clicking on the name of the departure or arrival station will bring up an arrival or departure board respectively for that station, with other trains highlighted according to the minimum connection time, to show whether they are valid connections into or out of this train. Below is an example extract showing a single station-to-station link from a schedule. The passenger facilities available, and the timing load that applies between the two stations, are shown beneath the arrival station. As these latter two can change during a train's journey, they are displayed separately for each station-to-station link—although for many schedules they will not change during the journey. This information can also be seen in the departure and arrivals boards, and is described in detail here. This shows the difference between public arrival and departure times. Useful for checking the duration of part of a journey at a glance. Not shown in the above example, but indicated where a train (typically a suburban service) is fully operated by the driver, without the services of a train guard to operate doors etc. There may still be other staff on board, e.g. for ticket inspection. This can also sometimes change en-route, and hence is shown separately for each station-to-station link. A station-to-station link comprises one or more intermediate track stretches. A short link between two neighbouring stations will often consist of only one track stretch, but a link between more distant stations will generally be divided into intermediate stretches, split at timing points along the route. The timing points that are relevant to a schedule (and thus the boundaries of the track stretches) are defined by the Network Rail train planning rules. Only the origin timing point for each track stretch is shown in the list; the destination timing point is assumed to be the same as the origin of the next stretch. Timing points that are themselves stations are shown in normal type; other locations (e.g. junctions with other lines, signal boxes, closed stations) are shown in slanted type. Most timing points are passed non-stop, and the departure time shown is actually a passing time. At some timing points the train will stop briefly (e.g. to exchange tokens at a signal box, for a crew change at a non-passenger stop, or to wait in a loop for another train to pass). In this case the time shown is the departure time, and the dwell time is included in the allowance/slack for the preceding track stretch (see below). For simplicity, the three are combined into one figure, to which any dwell time at the destination of the track stretch is also added, as described above. Where multiple running lines diverge from a timing point and the line taken is not obvious from the route of the train, it is indicated using an abbreviated line code (3 characters max). The line indicated is assumed to apply for the entire track stretch; a separate arrival path for the destination timing point is not shown. Note that many timing points only appear in a schedule if the train either stops, or crosses from line to another at that location. For full details of compulsory and optional timing points as well as the meaning of line abbreviations, see the Planning Geography section of Network Rail's Timetable Planning Rules (formerly known as the Rules of the Plan) for the relevant region. all ATOC-recognised (i.e. official) Fixed Links between stations. These are non-National Rail links, e.g. for stations that are within walking distance of each other, or linked by London Underground services, certain bus and ferry links where travel is covered by a through rail ticket, etc. You will be entitled to compensation payments if delays on an earlier service cause you to miss a valid connection and the resulting delay exceeds a certain length of time (the length of time, together with the amount of compensation due varies according to the train operating company that caused the delay). If you become stranded due to delays whilst travelling on a valid itinerary, any train company in a position to help must either arrange to get you to your destination by other means (e.g. a taxi), or else provide overnight accommodation for you. Both these benefits apply even if you use two or more tickets to cover your journey, or have broken and resumed your journey along the way—as long as you are travelling on a valid itinerary with valid tickets you will be entitled to assistance or compensation (or both) as appropriate. *Note: Allowing all minimum connection and transfer times is not the only criterion for a valid travel itinerary; you must also travel on a permitted route for the ticket(s) you are using, and obey any validity restrictions applying to the ticket(s). Not technically relevant to valid itineraries, nonetheless some stations are classified by ATOC as designated interchange stations and categorised into small, medium and large interchanges. Some journey planners use this information to decide where a change of train should occur when there are multiple options, hence it is interesting to know. This length of time must elapse between the respective advertised arrival and departure times of two trains, for the connection between them to be officially valid. For some stations, the minimum connection time varies depending on the operators of the trains being used. Any such exceptions will be shown direcly underneath the normal minimum connection time. This key appears when clicking through to the arrival/departure time at a filter station from the main departures/arrivals board, or when clicking through to an individual calling point in a train schedule. All services calling at this station on the given day are highlighted to indicate at a glance whether they are valid, missed or tight connections into/out of this specific train. See below for an example of the highlighting. 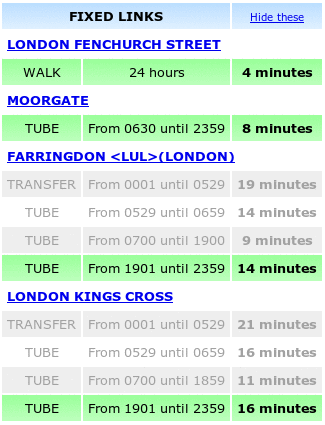 Fixed links are listed in order, sorted by increasing travel time from the current station. The travel time or mode of travel may vary depending on the time of day; if train-specific connection information is being shown (as in this example), any currently-valid fixed links will be highlighted in green. Note also that the times of day and journey times of fixed links can vary from day-to-day, particularly at weekends. In many places there are stations on different lines within walking distance of each other, and it is permissible to make part of a journey on foot between such stations. However a journey may not start or end with a walking link. Walking links are also important for the determination of permitted routes for a journey. The National Rail Conditions of Carriage defines the shortest route that can be used by scheduled passenger servies as a permitted route by default. If it is possible to shorten this route using recognised walking changes, resulting in a route shorter than the shortest route wholly by rail, then that is also a permitted route. Cross-London link using London Underground services. Many tickets have the cost of an Underground journey included in the price; this is usually indicated by a ✠ symbol. A link for which no public transport is available and which must be made at your own expense. Bus link, with transfer usually included in the price of a rail ticket. Note that the cost of a cross-Manchester journey using Metrolink is not normally included in the price of tickets, except for journeys wholly within the Greater Manchester area. Tram link. Rarely used; see METRO. Ferry link. Rarely used; ferries usually have explicit sailing times included in the schedule database. Taxi link. Rarely used; see TRANSFER. If there are more than five fixed links for a station, in order to reduce clutter they will not be displayed by default. However once you have clicked on either "Show fixed links" or "Hide these", your preference for showing or hiding links will be remembered during your browsing session. Valid connections, where the publicly advertised arrival and departure times respect the relevant minimum connection times, are highlighted in green. Impossible connections, assuming all trains run according to the working timetable (N.B. not always a valid assumption, for many reasons), where a connecting train departs at the same time or later than the other one arrives, are highlighted in red. All other possible connections are highlighted in orange. This includes the full range of almost impossible connections right up to easily feasible connections, which are only invalid because of overly long minimum connection times or large differentials between working and public arrival times for a terminating train. It also includes trains that don't have publicly advertised times (e.g. charter trains) and trains that don't pick up or set down at the station in question. Therefore trains with a public departure time of 0846 or later are considered to be valid connections. The departures board is sorted in order of working departure time, which makes the advertised differentials obvious. Assuming all trains run to the working timetable, both the 0844 departure (timed to leave at 0846) and the 0845 departure (timed to leave at 0847) allow at least the minimum connection time and are very feasible connections. But the differential between the public and working times mean that the minimum connection time is not met, hence these are classified instead as "tight" connections. 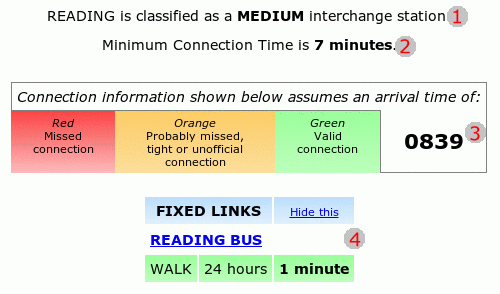 Not all orange-highlighted "tight" connections will be feasible; the connection time based on the working timetable is shown in small type beneath the public time as an aid to judge the feasibility. However as noted elsewhere, railway staff are normally instructed that a train should still leave at the publicly advertised time whenever practicable. This is the reason why orange-highlighted connections are not official—and will not appear in valid itineraries produced by journey planners. Nonetheless they can be, in many cases, feasible. The appropriate fixed link to use is determined after taking into account the minimum connection time, e.g. for an arrival at 1850 at a station with a 15 minute connection time, the appropriate fixed link would be whichever one is valid at 1905. For a given linked station, if there is no fixed link in operation at the appropriate time of day then the link to the other station will not be clickable. Otherwise, the hyperlink to the other station will show the connections at the other station highlighted according to impossible, tight or valid status. In this case tight connections are considered to be those available when the entire journey between the two stations (i.e. from platform to platform) can be made in the transfer time alone; the minimum connection times of the two stations are not taken into account. For a connection via a fixed link to be valid however, the minimum connection times at both stations must be allowed on top of the inter-station transfer time.